With her new album, SASSAFRASS! 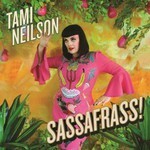 Tami Neilson takes a giant step that should only bring her more widespread acclaim. On this 11-track effort, she places a heavier emphasis on soul music while not abandoning her country and rockabilly roots. Neilson conjures up a wonderfully retro style that sounds like it could be a lost gem from the late '50s or early '60s; however, beneath the classic veneer are frank, highly relevant lyrics. Sassafrass, a slang word for a sassy person who isn't afraid to speak her mind, serves as a perfect title for this album. The songs, Neilson admits, reflect her developing a "low tolerance for bullsh*t" after years of encountering sexism in her life. They were also influenced by her being a mother of two young boys as well as by the death of her father, who led the family's band, the Neilsons, which was popular in Canada during the '90s. Neilson characterises her new album as a "mouthy lovechild of the current social climate and my own experiences as a woman, mother and daughter." The songs address the obstacles she has faced simply because she is a female. "It's also my attempt," she shares, "at challenging a society that doesn't yet treat women equally in order to shape a better future for my children." On SASSAFRASS! Neilson infuses just enough honey into her tunes to make her messages sound sweet in the listeners' ears. She certainly comes out smoking - in several senses of the word - on the disc's lead-off track, "Stay Outta My Business." The sassy, brassy soul number finds her fighting back at trash-talkers in splendidly defiant, hipshaking fashion. The tune "Bananas" might initially sound like an amusing slice of tropical exotica, but its message pokes fun at gender inequality. Similarly, "Kitty Cat" comes off as a rollicking rockabilly rave-up on first listen, but its moral is a reminder that men can't own a woman's "kitty cat." Neilson also tackles bad girl/good girl stereotypes and Hollywood sexual harassment, respectively, on the slinky, smoky tracks "Devil in a Dress" and "Smoking Gun." Neilson offers several poignant tributes as well on SASSAFRASS! The Rosanne Cash-esque country ballad "Manitoba Sunrise at Motel 6" was written in homage to Glen Campbell on the day he died. She salutes the late, great Sharon Jones on the high-spirited soul number "Miss Jones." "A Woman's Pain," a twangy tale told in a style that recalls Bobbie Gentry, tells the story of Neilson's first-nation grandmother. She delivers a lovely reading of the '50s-style romantic ballad "One Thought of You," which was written by her father. Tami Neilson's confident vocals are undoubtedly abetted by her being surrounded by familiar collaborators. She co-produced SASSAFRASS! with Ben Edwards, the co-producer of her last two critically acclaimed albums, Dynamite! and Don't Be Afraid. Backing her up in the studio was her talented band, the Hot Rockin' Band of Rhythm: Joe McCallum (drums), Mike Hall (bass), Brett Adams (guitar) and Neil Watson (guitar and pedal steel), who have toured with her around the globe over the past three years. A brass section and strings enhance the album's classic qualities.